The easy way to make this chicken salad is buy a rotissorie chicken in the supermarket or use Perdue Short Cuts, which is vacuum packed pieces of white meat chicken breast. They have a long shelf life. Watch the dates on the package. Sometimes the freshness dates will be for up to 6 weeks. They come with a variety of seasonings. Italian, Honey Roasted, and more. 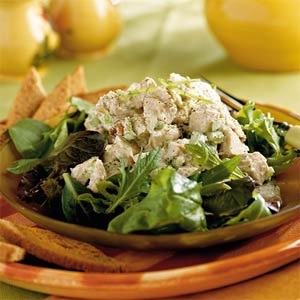 This chicken salad is great on tortillas, rolls, toasted white or wheat bread. Or just on a bed of lettuce with some fresh tomatoes. By late July, I am always left wondering what to do with all the stuff in the garden. Here is one way to make use of green beans and tomatoes. Bcause of having to boil the green beans and put them in ice water, this is best done at home. It keeps well in the fridge overnight. The beans and tomatoes are better after they marinate over night. 1 bottle of zesty Italian salad dressing or 1/2 cup of Mayo. 1 pound package of Rotini or some other small size pasta, cooked and drained.